He has been a co-founding editor of Haijinx - Humor in Haiku; as well as Bones - a journal for contemporary haiku; he was Linked Verse editor for  Notes from the Gean; Special Feature Editor for Lakeview International Journal of Literature and Arts; and haibun editor for Blithe Spirit, Journal of the British Haiku Society. 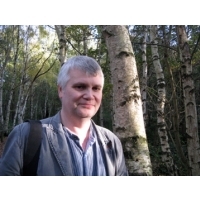 From 1998 to 2000, he was General Secretary of the British Haiku Society, and from 2000 to 2005 he was on the panel of editors for The Red Moon Anthologies of English-Language Haiku. He has been a Haiku Poet-in-Residence in various places from Bristol Zoo to Bath Spa University (2006 - 2007) and appeared in the Lonely Planet's Guide to Great Britain (2006). He was an invited haiku poet launching the Haiku Journal Notebook at the Royal Festival Hall as part of The Mayor's Thames Festival in London (2008); and Embassy of Japan's roving Haiku & Renga poet-in-residence for Japan-UK 150 throughout 2009; as well as a TEDx speaker for haiku. Awards and Other Honors: Third Place, 2018 Henderson Haiku Contest (Haiku Society of America); Honorable Mention 2018 Monostich Haiku Poetry Contest; WonderFold Contest winner for haibun (January 2017); Winner, Touchstone Individual Poem Award for 2016; Shortlisted for Museum of Haiku Literature (Japan) (2016); Joint Winner, tinywords photo prompt 15.1 (2015); Runner Up, The IAFOR Vladimir Devidé Haiku Award 2015 (International Academic Forum); 1st Prize, The Liverpool Virtual Book Fair Twitter Haiku Contest 2014 (International Festival of Business); First Prize, World Monuments Fund 2012 Haiku Contest (New York USA); Prize winner for the Japan Times Community Anniversary Haiku Competition 2012 Various Best of The Mainichi Shimbun 2011; Japan Times award-winning writer for haiku and renku (2002); M.A. in Creative Writing, Bath Spa University (2007-2008); Diploma in Creative Writing, University of Bristol (2000-2001); Haiku Pathway Katikati, North Island, New Zealand [haiku engraved on river boulder in big haiku park run by Katikati Open-Air Art Inc.] (2000); Winner, The Haiku Calendar Competition 2011 (Snapshot Press)/2012 Haiku Calendar; Runner-up, Snapshot Press Haiku Calendar Competition (2000, 2002, 2003, 2004, 2006, 2009, 2010, and 2011, plus winning December entry in 2011); Honorable Mention, International Section, 14th Mainichi Haiku Contest (2010); Honorable Mention, 5th Mainichi Haiku Contest (2000); Commended, Anthology Haiku Competition AN3-2000, Novi Sad, Yugoslavia (Serbia); Joint Winner in HI magazine, Japan HIA 10th Anniversary Haiku Contest (1999); Commended, Jack Stamm Haiku Award 1999, in a heron's eye anthology (Paper Wasp, Australia, 1999); Highly Commended, Snapshot Press Haiku Collection competition (1998); International Kusamakura Haiku Contest Nyuusen Prize (1998); Ritsumeikan University of Kyoto Peace Museum Award for haiku (1998); Runner-up, Still magazine haiku competition (1998); 2nd Prize, Presence ISSN 1366-5367 SciFaiku Contest (1998); Highly Commended, PPQ (poetry postcard quarterly) U.K. Haiku Championship (1996); The Mainichi Shimbun 125th Anniversary [haiku contest & anthology] (Japan, 1997); Fellowship of Australian Writers, Qld. Inc., (FAWQ) 1st Prizes (1995 & 1996); Winning haiku: Burnished Pebbles - Haiku and Short Poems Calendar (White Mountain Publications, Canada, 1995); 3rd Prize (and Commended entry) Canadian Writer's Journal poetry competition Vol 12 No.3 (1995); Commended, Fellowship of Australian Writers, Queensland. Inc., (FAWQ) Haiku Competition (1994); Commended, New Zealand Poetry Society International Poetry Competition (1994), the old moon and so on anthology (The New Zealand Poetry Society Inc., 1994). Books Published: c.2.2. : Anthology of short verse ed. Alan Summers and Brendan Slater (YTBN Press 2013); Does Fish-God Know (YTBN Press 2012); The In-Between Season (with Words Pamphlet Series 2012); Four Virtual Haiku Poets, ed. Alan Summers and Brendan Slater (YTBN Press 2012); Fifty-Seven Damn Good Haiku [Editors, Michael Dylan Welch and Alan Summers] (Press Here, Sammamish, Washington, 2011); The Poetic Image - Haiku and Photography [Alan Summers, Haiku Editor] (National Academy of Writing / Birmingham Words ePamphlet, 2006); Parade of Life: Poems inspired by Japanese Prints [co-editor with Paul Conneally] (Poetry Can / Japan2001 / Bristol Museum & Art Gallery, 2002); Sundog haiku journal: an Australian year [collection] (Sunfast Press, 1997; reprinted 1998) California State Library - Main Catalog Call Number: HAIKU S852su 1997); Moonlighting pamphlet [collection] (British Haiku Society Intimations Pamphlet Series, 1996). empirical owls . . . Credits: "the rill's trick" - Third Place, 2018 Henderson Haiku Contest (Haiku Society of America); "lullaby of rain" - Editors' Choices, The Heron's Nest Vol. XIV No. 4 (Dec. 2012); Runner-up, The Haiku Calendar Competition 2013; The Heron's Nest Vol. XIV No. 4 Dec. 2012); The Haiku Calendar 2014 (Snapshot Press, 2013); The Haiku Foundation Per Diem (July 14, 2018); The Haiku Foundation iPhone App Version 5.0 (January 2016); EarthRise Rolling Haiku Collaboration 2016 "Foodcrop Haiku" (The Haiku Foundation); naad anunaad: an anthology of contemporary international haiku ed. Shloka Shankar, Sanjuktaa Asopa, Kala Ramesh, India, 2016 (Haiku Society of America Merit Book Awards, Best Anthology [tie] 2017); The Wonder Code ed. Scott Mason (2017); "down side streets" - Presence Editor's Choice 5; Presence 10 (1999); seagull haiku ed. laryalee fraser (2006); The New Haiku (Snapshot Press, 2002); The Disjunctive Dragonfly, a New Approach to English-Language Haiku ed. Richard Gilbert (Red Moon Press 2012); Haiku in English: The First Hundred Years ed. Jim Kacian, Allan Burns & Philip Rowland (W. W. Norton & Company 2013); Journeys , An Anthology of International Haibun ed. Dr. Angelee Deodhar 2015; "empirical owls" - Gwdihŵ haiku sequence, Wales Haiku Journal issue one (Spring 2018); "night of small colour" - Modern Haiku Vol. 45.2 Summer 2014; Brass Bell Showcase: Alan Summers (July 2015); Haiku 2015, ed. Scott Metz & Lee Gurga (Modern Haiku Press, 2015); Yanty's Butterfly Haiku Nook Anthology ed. Jacob Salzer and the Nook Editorial Staff (2016); Poetry as Consciousness - Haiku Forests, Space of Mind, and an Ethics of Freedom ed. Richard Gilbert & Illst. Sabine Miller (Keibunsha, Japan 2018); "house clearance" - Blithe Spirit vol. 26. No. 1 (March 2016); Shortlisted, Museum of Haiku Literature Blithe Spirit vol. 26 No. 2 (May 2016); Winner, Touchstone Individual Poem Award for 2016; old song: The Red Moon Anthology of English-Language Haiku 2017 ed. Jim Kacian and Red Moon Press Editorial Staff; 2018 Haiku Canada Members' Anthology /L'anthologie 2018 des membres de Haïku Canada ed. Marco Fraticelli and Philomene Kocher.